Fall calls for the start of comfort foods. I can’t get enough thick soups and casseroles this time of year! I remember loving my mom’s chicken noodle casserole when I was a kid. 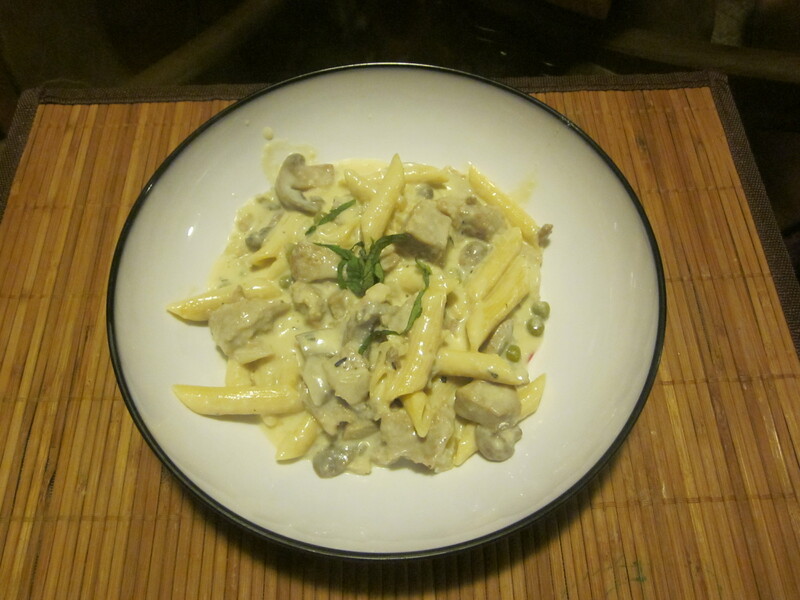 Though this is not based on her actual recipe, it is kind of like my veganized version from my childhood memory. I have been trying more crock pot recipes out lately & intend to try more, especially the long-cooking ones… It’s amazing to come home from work and smell dinner cooking. Its like having your very own private chef! This would be an easy dish to take to a fall pot luck! I was so pleased that my 3 & 5-year old kids liked this. In fact, I didn’t tell my daughter she was eating seitan (she thought it was “tofu chicken”, which she loves) until she was into her second serving and asking for more of the “tofu”. She was even giving me seriously exaggerated “MMM”‘s! every time she had a piece (she was loving it so much she was rolling her eyes with every bite!). When I told her she was eating seitan -& loving it – her eyes practically popped out of her head! LOL… We have had numerous failed attempts at finding ways to get the kids to eat seitan, it’s just not one of their favorites. SO, I was stoked it was a hit! 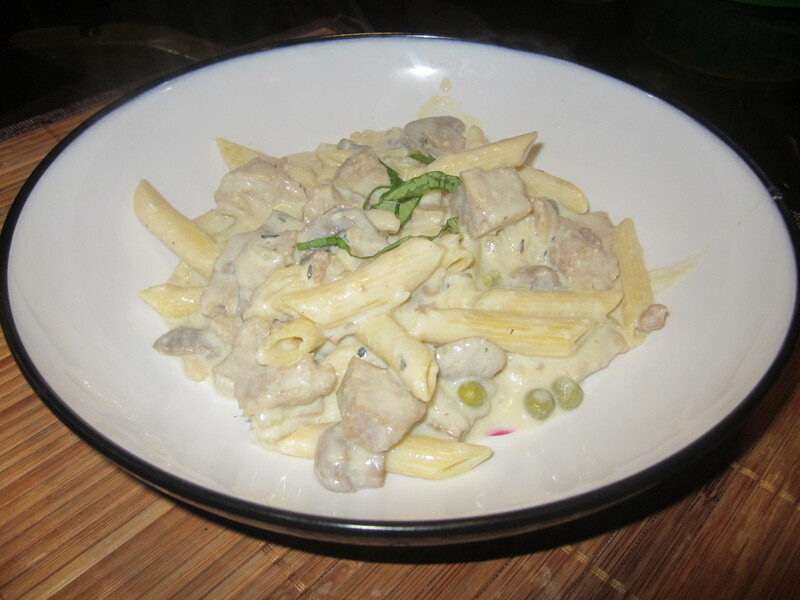 Hurray for another delicious & healthy recipe that they enjoy! 🙂 I hope you enjoy this as much as we did! This could easily be baked in the oven in a casserole dish though I until I try it myself, I cannot vouch for oven temp/cooking times as of yet. 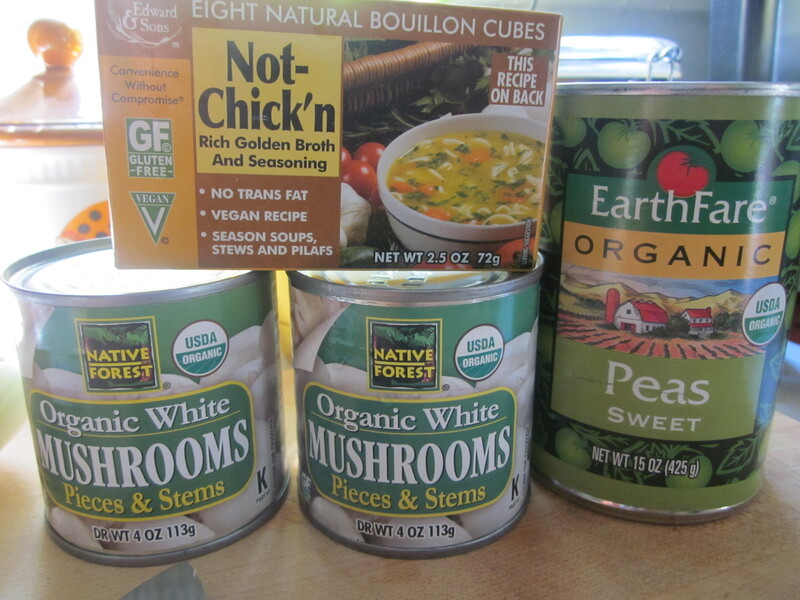 A few of my ingredients.. though you could also use fresh mushrooms and peas if you choose. At this point you can refrigerate both the sauce and the veggies, separately, until the next day if you are preparing this ahead. 3) Oil the crock of your slow cooker and combine the sautéed veggies, cashew cream sauce, disintegrated bouillon cube, milk, seitan, pasta, thyme & pepper in the slow cooker. 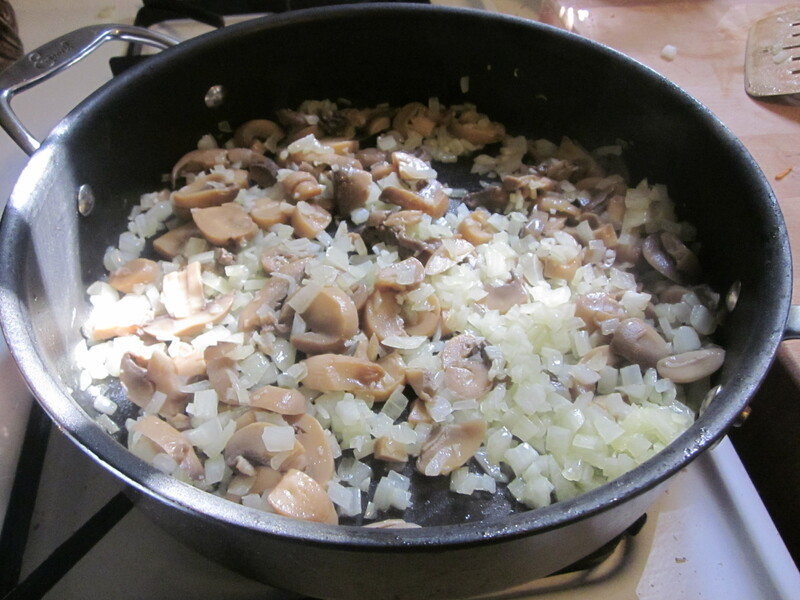 Mix thoroughly and cook on high for 1 – 1 1/2 hours, or until the pasta is al dente. Give it a good stir about every 20 minutes or so. Ready to seal her up for an hour and a half to cook and thicken up! 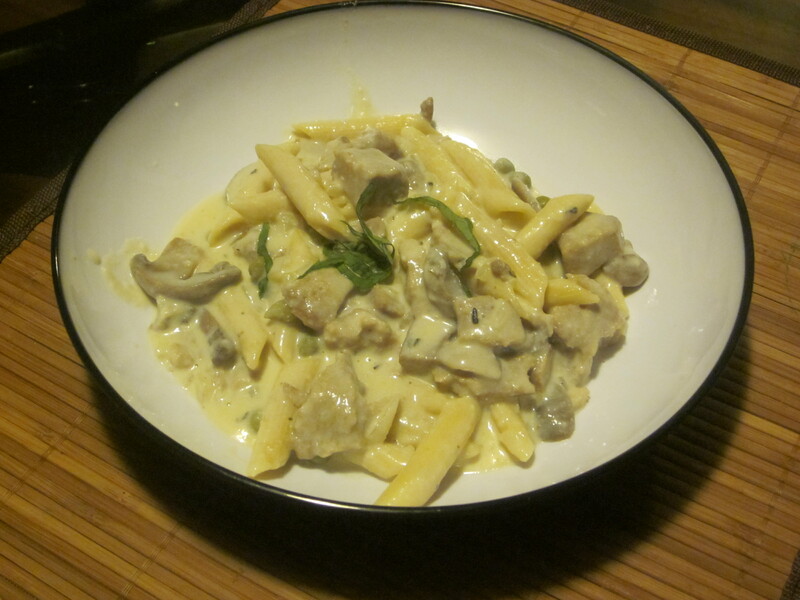 4) If the pasta is ready but the sauce isn’t thick enough, stir in the flour. This should help thicken it up. (Note: I added in the flour to find that after I had taken the lid off the crock pot, it thickened up more on its own very quickly!) If desired, add your topping before serving. Devour!! This was truly delicious & easy. Will make again for sure. Id love to try baking it in the oven sometime with some French Fried Onions on top. Let me know if you try that! And as always, suggestions and comments are appreciated! 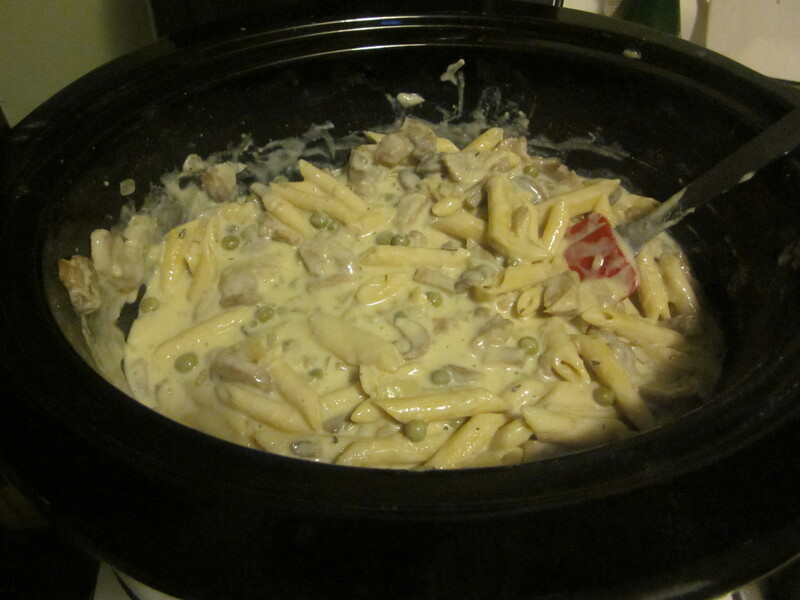 This entry was posted in Crock Pot, dinner, fall, holidays, pasta, seitan, Vegan, vegetarian, winter and tagged casseroles, chicken and mushroom casserole, creamy casserole, crock pot, crock pot casserole, vegan casserole, vegan chicken and mushroom casserole, vegan chicken casserole, vegetarian chicken casserole. Bookmark the permalink.